If I had to choose, I think breakfast is probably my favourite meal of the day. There isn't much that can beat a bacon and egg sarnie on buttered white bread, especially to beat away those post "oops I had one too many" blues . Or even a bowl of cereal doused in ice cold milk. There are few ills in the world that a few slices of toast licked with butter and a mug of builders tea can't fix. I think the scene is adequately set. Its Saturday and I need to eat. I have nothing planned, the weather is nice, I am up early and am heading for one of the most hyped places in recent eating history. 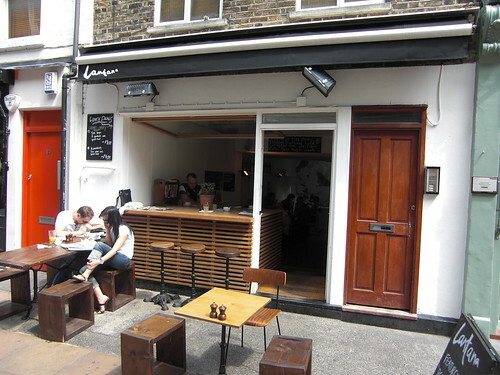 Lantana is a small (-ish) cafe located just off Charlotte Street. It specialises in what I consider "breakfast food", but certainly has a good reputation for a whole lot more and has been mentioned so many times in the blogosphere, one more write up couldn't hurt. I really don't have an issue eating on my own and Lantana is perfectly set up for its solo visitors with its "breakfast bar" out the front. I get there early (for a Saturday). Its 11:30 and its buzzing and already packed bar one seat out the front which I happily occupy. First up I ordered a flat white from the infectiously cheerful Aussie girl who was serving me. The sign outside claims that it is one of the best in London, and indeed it is very good. 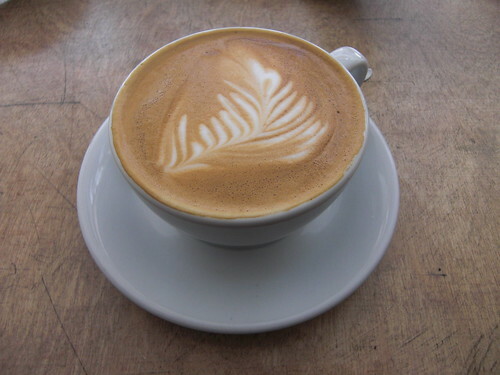 Although it arrived lukewarm (my second was piping hot), it was as smooth and creamy as any coffee I have tried in London and had that mellow caffeine hit which jolted me back from my pre-food malaise. Great stuff. What I got next was as close to brunch heaven as your going to get (IMHO). It looks like a bit of a mess but there is so much going on here. First, there's the main part of the dish, the halloumi. Salty and perfectly grilled, its a perfect foil for the iron rich spinach, sautéed with fine flecks of garlic, located underneath. Dive a little further and you hit the deep and earthy flavours of the flat cap mushrooms, dotted with a herb pesto. All this topped with a perfectly poached egg yielding a golden runny yolk. On the side, some of the sweetest roast tomatoes I have ever eaten as well as some toasted sourdough, slowly mopping up the juices collecting at the bottom of the plate. In addition, I ordered a side of bacon (I need meat), the perfect foil for all of the above. I really hope my description gave this dish justice. I know its not been the same experience for everyone, but this was as close to a perfect dining experience as I can remember. I ate my food so fast that I was sure I was going to give myself indigestion and even considered ordering more food although I was thoroughly stuffed. I really like this place, can you tell? It is already seriously hyped up, and I guess I have just added to it, but the food they are churning out is seriously tasty, as is their coffee. I would love to eat here every day if it wasn't for the fact that I work miles away and that it is quite dear. I guess you get what you pay for, but come pay day, your going to find me out the front, reading my book, drinking my coffee and best of all, tucking into my food. Breakfast is definitely the best part of my weekend. Outside or in bed, eggs and bacon don't have the same flavour thant during the week. 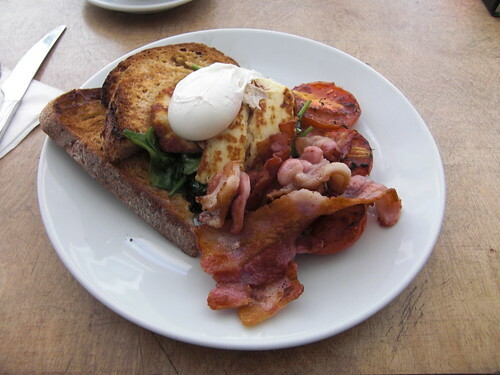 To take the time to enjoy a real breakfast really makes my day and I will have a go to Lantana soon.